CommentKahuna is Windows software that can be freely downloaded for the price of an email address from PortalFeeder. It is designed to search for blog posts that rank in Google for a particular phrase and makes it easier to comment on them. Once you’ve typed in your keyword phrase it will locate up to 50 blog posts on the topic you’ve searched for that are ranking in Google. It also shows the Google PageRank for each post and has options that can be tweaked to filter by PageRank if that kind of thing floats your boat. Once you’ve got your list you can scan the URLs and check off which ones you might want to comment on. Then a little window pops up with the blog post in it so that you can read it, and if you’d like to comment there is an autofill button that plops your name, email address and URL into the right places. Nice and efficient. Once you’ve commented you click a button to move onto the next post that you flagged. If you’ve decided not to comment on any of them there is a skip button as well. Once you are done with the whole thing it makes a record of the blogs you posted at so that you can check back in on them. Am I a manual comment spammer? No, but if I was this is the perfect tool for the job as long as I wasn’t paid by the hour. Actually, I think this is a pretty great tool for social media marketers that looking to find conversations that Google finds noteworthy enough to rank. Since these blog posts theoretically rank well in Google they are likely to become centers of conversation around that particular search phrase. I’m a firm believer in adding as much value to the conversation as I can muster whenever I post or comment. It may be a touch naive, but I believe in the long run Internet Marketing techniques that contributing quality content to a particular niche will outperform the quantity approach of making 5 second throwaway comments and then moving on to the next blog. Aside from the added efficiency, CommentKahuna unearths some pretty interesting conversations that I’d missed on topics I’ve researched. I’ve plugged in about a dozen searches and have been fairly impressed — I hadn’t found many of these doing a search in Technorati or Google Blog Search. Strangely, while I did poke around in Google’s regular index to try to spot the blog posts that CommentKahuna identified manually the results didn’t really seem to mesh up and it missed some blogs that I definitely know were WordPress blogs, which was the poll I had restricted my searches on. I’ll have to investigate this more because obviously if the results don’t mesh up to the actual results in Google’s regular index than it might lessen the utility of the whole thing. I’d love to know how the result set is generated. PortalFeeder has taken plucked this program out of their suite of exclusive desktop tools they provide for their members and is offering it for free to help create some buzz for the launch of PortalFeeder 2.0, the new and improved PortalFeeder membership program. I suspect most of their users have traditionally used this to raise their backlink count in Google. If this software also took into account the number of followable outbound links each post had in it and roughed out how much PageRank might be passed be the individual blogs it would probably be a killer app for SEOs. One click buttons for submitting the pages that you comment on to social media sites. It isn’t enough to just put your comments out there — you want to promote the blog posts that you have commented on in order to increase traffic to them. Some of the traffic will trickle down to you, making your comment more impactful. Provide a spell checker for the comments box. As it uses Internet Explorer as a foundation my Firefox spell checking add-ons are nowhere to be found. Enable it to also factor in and display show inbound link information from Yahoo and Technorati. Show the titles in the list interface as well as the URLs. Oh, and this would really rock as a Firefox add-on. I’m trying to live a monastic, browser-centric life as much as possible and the less software installs the better. You can download CommentKahuna here. By the way, this isn’t any kind of affiliate link — not because I have anything against them, but more because in this case I’m too lazy to try to locate one. I’ve just tried to install it under wine and linux. It’s sad that this program can’t distinguish whether a blog has a nofollow attribute on its outgoing links. In all other respects it sounds great. Hopefully people (specifically spammers) don’t start to abuse the tool. @Malignition.com – Actually, they’ve just come out with a version that does exactly this. I downloaded it yesterday and haven’t had the chance to test it too much yet but it seems to do the trick. I had no idea that service like this existed. I must check it out, thanks. I downloaded CommentKahuna a few weeks ago and found it easy to set up and start using. I’d like to see a spell checker in a later version as well. Otherwise, I think it’s a great tool for promoting your websites. Nice tool but doesn’t it go towards black hat seo ? Thank you for a nice software review. I tried CommentKahuna but now I am using Fast Blog Finder. It supports the features you wrote about such as spell checker, social bookmark tools, ability to show the number of outbound links on the page. So, I’m quite satisfied with this tool. I tried Comment Kahuna and sadly found it wanting. It was extremely difficult to find blogs that didn’t do nofollows on the posts. It seemed to me that it checked the whole page, and if it saw any nofollows, that blog was black listed. Rather a crude approach if you ask me. I gave it 2 hours of my time and found a few blogs, but nothing worth bothering with to be honest. I guess if you have more time than money, then maybe this is a good tool for you. This is such a wonderful tool! You can’t imagine how much time it has saved me in locating blogs, especially finding the ones with “nofollow” turned off. The new version sure does the trick! Good one. I hate tools like that. No doubt it’ll rather help to spam blogs. You’ll soon have lots and lots of spam in your comments. Fantastic tools, nut provided you can get throught the registration screen. I have bought comment kahuna last month, is not what I expected. It’s still not many blogs inside the system. I think that is a really good thing for those people who like to write comments. Sounds like a neat tool! I’ll have to look into this! Thanks for sharing! I have only heard about this just recently, how long has it been since this program has been released. I recently got this, and I’m trying it. So far so good.. you’re right though it needs more since I use firefox. But I guess they don’t care they’re just offering it for free for the e-mail addy. I am actually using it for my link building and it actually brings up blogs in my locall language too. Now these results are not 100% accurate, but it well worth the while. I like this blog alot. Keep this coming..lots of good info..Comment Kahuna is pretty cool, been using it for a while now. Looks like a great tool, I’m going to check it out for sure! Thanks! …Looking through the rest of your blog. This is the perfect link building tool. I have yet to install and play around with it but non the less it is exactly what I’ve been looking for. Now the question is how hard is going to be to find Do Follow blogs. Definitely have to give you props for finding such a program. Thanks! I’ve discovered fast blog finder and must say it’s far better than Comment Kahuna. However, you do have to shell out $50 for it. Comment Kahuna was great for finding blogs using “Do Follow” but since then I see it’s been done away with? I’ve been testing it over the last couple of months and it doesn’t seem to be able to differentiate this anymore. I think this software works very well for finding blogs to comment on. For those who are just looking for dofollow blogs, you’re completely missing the point of commenting on blogs. Blogs are meant to be a social media and those of you who are merely searching for backlinks from leaving your comments, you’re no better than comment spammers. Commenting on blogs should be done genuinely and only if you are interested in the discussion at hand. thats a great post however i find comment hut more efficient. commentkahuna is wonderful. Easy way to find related blogs. Wow, this will make my life so, so, SO much easier. Thanks! Interesting. I do have to wonder though, what’s the catch ? Any chance this has malware hidden in it ? Provided it does what it says, it could drive a huge amount of manual comment spam. CommentKahuna is quite a neat tool to find dofollow blogs but the question is it the magic wand for you … NO .. Most of dofollow blogs are heavily moderated and do not approve any comment unless it is really interactive and provide some value, now I am commenting to get a link from Smoblog, fine .. it took me 5 minutes to read the whole post in order to do a useful comment … and another five minutes to write … all that comes with no guarantee that my comment will even get approved .. so the dilemma with blog commenting is not finding the dofollow blog, it is all about if you can afford spending that much time commenting on blogs, does it really wroth your time? This is the big question. 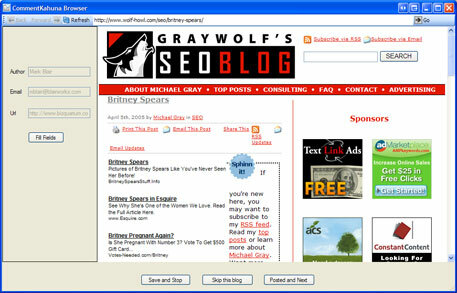 @SEO GTA – very good point about the stricter moderation on dofollow blogs. Drive-by comments typically get tossed out, and so it is good to put your thinking caps on for a few minutes and not just spin everyone’s wheels. This comment contributes to the conversation, makes the cut, and earns its keep. I tried it and had pretty mixed results. It does find blogs but a lot are nofollow so it’s up to you whether it’s worth commenting on these blogs. But that said it’s the best free one I’ve seen. The one I use now I paid for. I like this link building tool, and finding the blogs you are looking for is a matter of typing in the right key words really. Nofollow detection would be even better but at least it provides you with a good list to start off with. wow excellent find, I will have to try this out thanks! Hi..I’m using this for a while but once I move from notebook to UMPC the post button missing. Anyone experience same as me. This is great software….